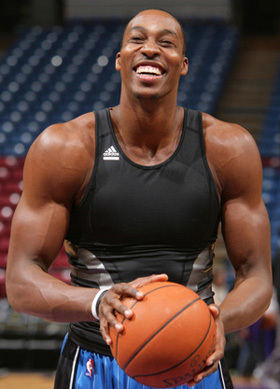 Just the other day, someone asked me if I had a man crush on Dwight Howard’s shoulders. The answer? Why yes, yes I do. Now, let’s not go off the deep end, as I think he’s completely overrated and the Kim Kardashian of the NBA (famous for never really doing anything). But, attaining “Dwight-caliber” shoulders will remain a pipe dream for the majority of Americans. The reason? They already have a bad shoulder. It’s important to start off by saying that there are tons of problems that can occur in the shoulder. But as I wrote here, focusing on the joint that hurts can be somewhat of a misguided approach, since the painful joint may be doing everything correctly. In the case of the shoulder, the culprits for shoulder pain can often be a bad thoracic spine or scapula. As I’ve written about the joint-by-joint theory in one of my previous posts, I want to briefly touch on how this theory of “mobile levers on stable joints” relates to the upper torso. If we think of the upper back, or thoracic spine, you’re supposed to be relatively mobile. Think of any type of athletic move (such as a golf swing, a baseball pitch, etc.) and you’ll see that there is a ton of extension/rotation that occurs through the upper back. In fact, to understand how important this concept is, try to do anything athletic while doing an impression of the Hunchback of Notre Dame. Safe to say, it’s going to be awkward. I don't think it's a stretch to say that this cartoon probably had his fair share of shoulder issues..
Next, we come to the scapula, otherwise known as the shoulder blade. According to the theory, this area needs to be stable. Why? Because unlike the hip, which has a nice fitting of the femur into the socket (which nerds will refer to as the acetabulum), the shoulder is a joint that’s really just a bunch of bones all wrapped together. If you take away the scapula when it should be stable, we can liken it to taking away part of your hip socket. If that happens, your shoulder will spontaneously burst into a flaming ball of failure. Finally, we get to the shoulder joint, which needs to be mobile in order to reach for anything or throw a baseball. While I won’t get into the specifics of shoulder/rotator cuff mechanics yet, it’s important to point out that any kink in the chain can really complicate matters up here. If you don’t have great t-spine mobility, your scapulas will not be able to get stable in the right position, and your shoulder will not have a sufficient base of stability in order to be mobile. First up, you have to make sure you can breathe correctly. You may be saying “What the what!? I need to breathe? I’m pretty sure I know how to do that, since um…I’m still living, AND BREATHING!” Well, that’s true, but it doesn’t mean you’re doing it correctly. Our bodies are extremely talented at compensating for movements and patterns. Since breathing will always trump everything else as priority #1, we may have picked up some inefficient breathing patterns which can naturally occur from sitting in a desk all day or in other positions. (As a quick test, take note of how you’re sitting. Now, switch positions entirely so that you’re a mirror image, just on the other side. My bet is that you’ll feel a bit uncomfortable in the second position). Now, I just want to quickly return to why breathing is important. As I mentioned in the video, bad breathing patterns can “turn on” muscles that we don’t necessary want to have “on” when we breathe. How this relates to shoulder mobility is that if you’re properly maximizing the diaphragm and your deep abdominals, these muscles will begin to do their job, which will “dim” or “turn off” the muscles in your upper torso that were doing the brunt of the breathing work. Once that happens, then we can really start to get your mobility back! Check back next week for part 2, where I’ll show you the next step to regaining mobility and fixing that shoulder!